Color me crazy, but the amount of work that has gone into vCenter Operations Manager, now labeled as vRealize Operations, is quite impressive. As in … wow, where has this thing been hiding? Let’s make sure everyone on the VMware development team that had a hand in the Operations product gets a SpongeBob plush and a high five. Perhaps two. Anyway, let’s dig in because there’s a ton of content to digest. Remember the movie Spaceballs where Yogurt is showing off all the branded Spaceballs stuff? The VMware team also expressed how many software extensions and partnerships have been formed with companies like EMC, VCE, HP, Brocade, NetApp, F5, Dell, Cisco, Arista, and so on. vRealize Operations 6.0 also supports a number of slices within the Software Defined Data Center (SDDC), such as: NSX and Arista for networking; VSAN, iSCSI, and NFS for storage; OpenStack hosts, controllers, and NSX; and vCloud Air clouds, regions, virtual data centers (VDCs), vApps, VMs, and cloud types. 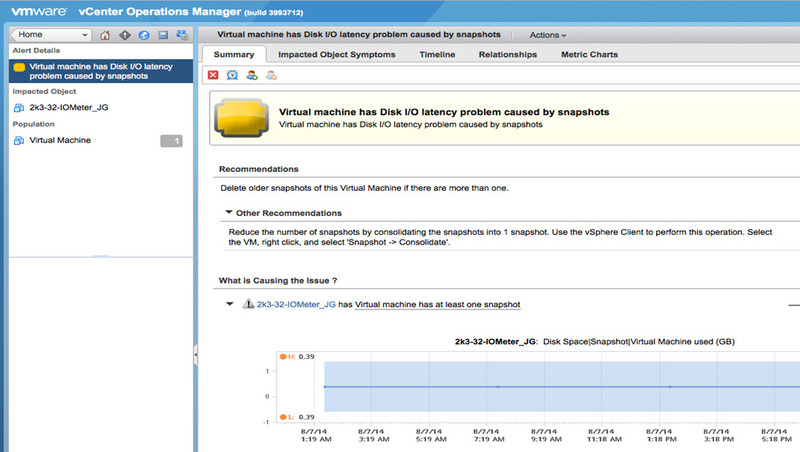 This is becoming one heck of a snazzy operational keystone within the vSphere ecosystem. In particular, the Management Pack for Storage Devices caught my eye. Take a look at the width and breadth of products and fabrics supported via CIM, SMI-S, or VASA below. Troubleshooting the FC SAN is often a real pain for folks, and this view of the logical SAN construction is pretty snazzy. Perhaps this is niche or will be better served by an application specifically written for AWS instances, but some visibility is certainly better than zero visibility. Especially if the infrastructure team had no say in where the workload was placed – which happens from time to time. 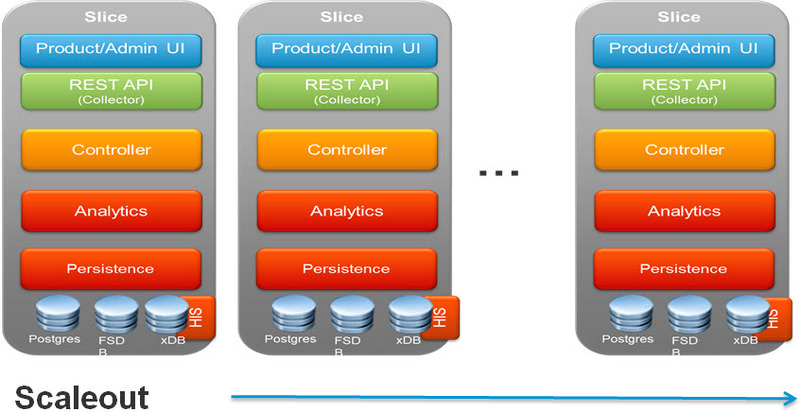 vCOps has traditionally been deployed as a vApp that contains two virtual machines: UI and Analytics. These bad boys require roughly 16 GB of RAM and 4 vCPUs for the “small” size deployment, and scale up from there to a “large” size. The down side to this is that all of the performance is stuck in a bottleneck around the Analytics VM as it crunches data. A single VM can also scale only so large before it gets silly. The VMware team also talked about the initial pain points around out-of-box configuration for vRealize Operations. I’d have to agree – there’s a lot of time spent fiddling with thresholds, badge tolerance levels, and alerting scopes. Otherwise, the amount of alerts that trigger are simply staggering. Now, the product comes with a wizard to help tune the appliance to your particular tastes. I’ve included a few sample questions below. I think you get the drift. The answers will help shape the policies used to provide realistic and actionable results. I hope to see an option to let the tool look at your environment for a while and offer suggestions, but this is a good start. 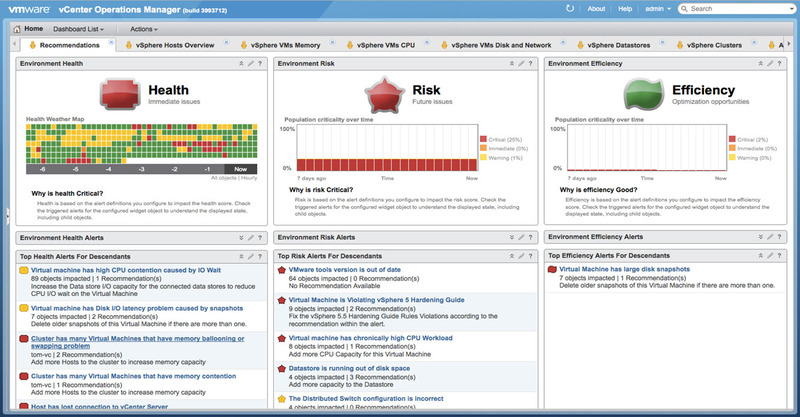 vRealize Operations also received a bit of a face lift. I’ve included a few sample screenshots below. You’ll likely notice that there’s a lot more details on just what the heck is going on, rather than relying on the “skittle” colors (those little colored boxes) to lead your nose along to trouble. Each of the three major metric columns also includes Top Alerts for Descendants with different colors and impact values. The alerts themselves are also much more descriptive, such as this one below focused on disk IO latency due to a snapshot. Hey, a useful alert! Maybe the canned alerts aren’t cool enough for you? I grumbled something similar for a long while, and now – as if by magic – you can create custom alerts. But that’s not even the cool part. 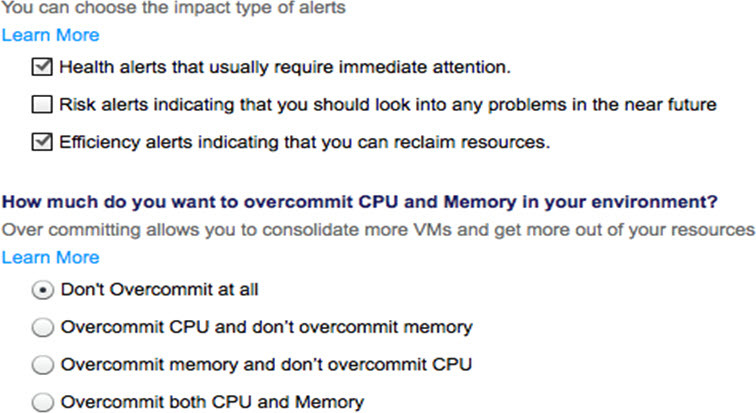 No, custom alerts are just table stakes. The cool part is what you can DO with custom alerts. Let’s take this sample screenshot below as a working example. The Symptoms area defines what to look for. In this case, it’s a VM that has one or more snapshots (the first match) and also suffers some sort of disk IO latency (the second match). If both are true, the recommendations area can execute remediation steps via vCenter, vCenter Orchestrator, or Python scripts. The recommendations can also be prioritized. The first recommendation, with a priority of 1, is to delete older snapshots (assuming there are more than 1). The lower priority item is to consolidate the number of snapshots into a single one using the vSphere “consolidate” operation. Making vRealize Operations extensible and part of the workflow is an incredibly powerful way to further the value received by the product. Two thumbs way up! 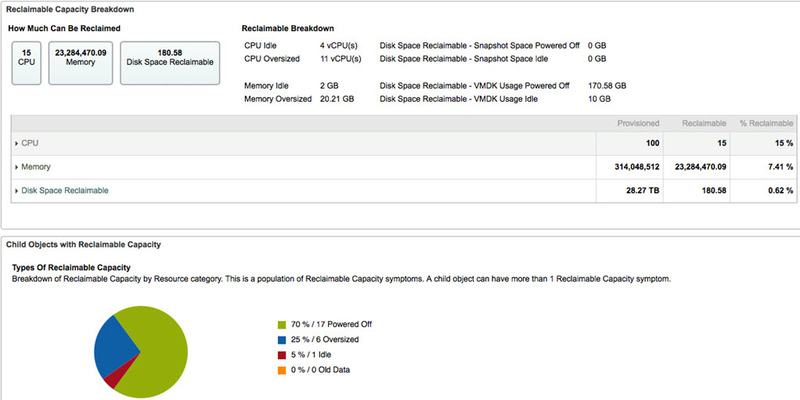 Another area of vRealize Operations that received a breath of fresh air is the capacity planning tabs. Older versions felt like Capacity IQ had simply been bolted on with little value added – it was also quite clunky to find and consume as a user. The new capacity indicators – including time remaining and stress – have more granular breakdowns of capacity metrics. This also includes the use of user policies and workload profiles. Below, I’ve grabbed a screenshot showing CPU capacity with respect to both demand (which still has room) versus allocation (which is out of space). Admins can also work with business units to build project plans that are based on new or existing workload profiles. While this existed in the previous version of the Operations tool, it now has much more visibility and control. As a new project is entered into vRealize Operations, the status can be controlled between planned and committed. This will help timeline out the various projects that are pumped into the virtual environment and show why resources are being consumed. Remember hearing about those zombie VMs that were sitting around idle, eating away at resources but contributing nothing interesting in return? This process feeds into resource reclamation by finding oversized and wasteful virtual machines. The Reclaimable Capacity widget shows off all sorts of easily digestible data and is much easier on my eyeballs than the days of yore. But that data has historically been something you have to read manually and adjust by hand or by script. 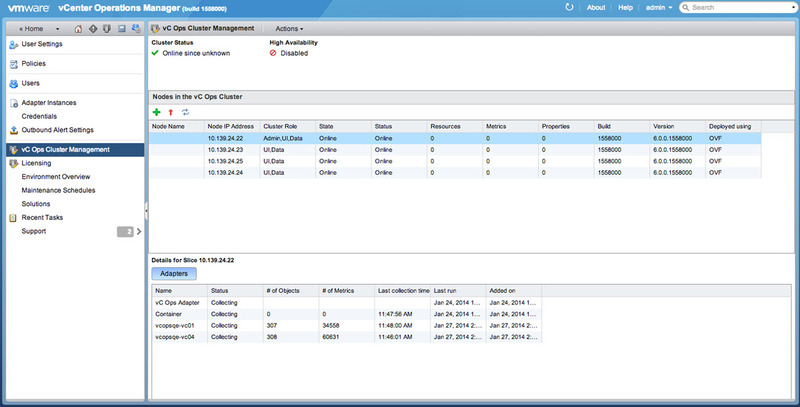 vRealize Operations 6.0 includes the ability to actually act on this data through various drop down menus. 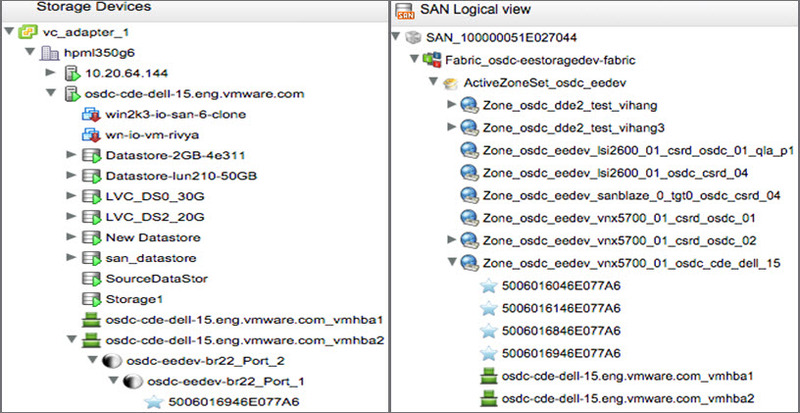 As shown below, an administrator can choose to right-size a VM based on the reclaimable resources suggestions. 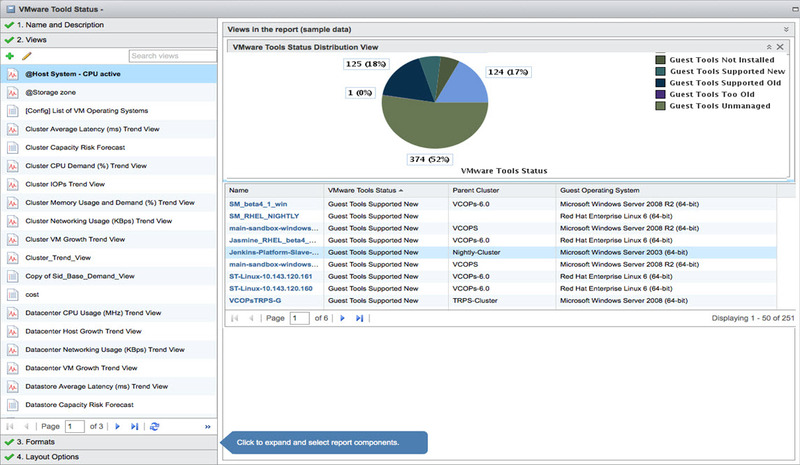 The menu above is available directly from the vRealize Operations interface; it does not require going into vSphere. I haven’t tested it myself, but I make the assumption that the user executing the action must also have privileges to follow through with the action. Did you file your TPS reports yet? Hopefully not, because now you can create custom reports, instead. And who doesn’t love reports! I’m filing reports while writing this, because they are that much of a joy. I’m sure that someone enjoys running reports for personal glory or to keep Lumbergh off their case. And so, here you go. I look forward to upgrading my beta bits in the lab and working with this product further once it hits GA. Interesting, indeed. However someone needs to have a SERIOUS talk with marketing as to who keeps coming up with these RIDICULOUS product names (and how often they’re changed). I installed it over the Christmas holiday’s and at first I wasn’t too impressed. Over the past 2 months however I’ve been discovering just how useful and convenient it is.